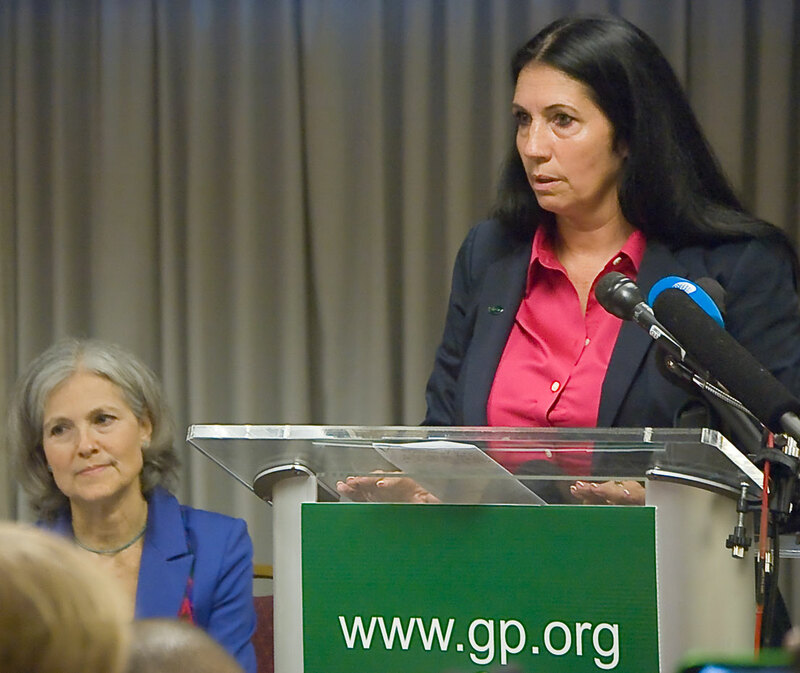 Cheri Honkala was born into poverty in Minneapolis in 1963. For the past twenty-five years she has served as national director of the Poor People’s Economic Human Rights Campaign, helping to lead marches, tent cities, homeless encampments, sit-ins and educational retreats. Working as part of an organization with a bare bones budget, Cheri has still managed to travel the United States and the world, making connections among poor people’s organizations from every continent. She is now the Vice Presidential candidate of the Green Party, sharing the ticket with Massachusetts doctor Jill Stein. This is the first time in history that a formerly homeless person has run for one of top two spots in American government. What made you decide to run for Vice-President on the Green Party ticket? I ran for Philadelphia sheriff as a Green in 2011 on a zero foreclosure platform. I pledged to refuse to throw families out of their homes. Other Greens learned about who I was and about the Poor People’s Economic Human Rights Campaign I’m part of. When I received the call that I was under consideration as Jill’s running mate, I thought there would be no way in hell that I would be chosen because I have been arrested over 200 times fighting for the basic necessities of life. But they knew exactly who I was so they did call me and ask me to be Jill’s running mate. 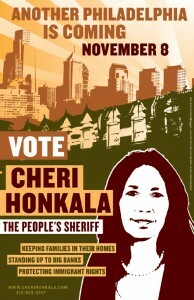 What was the role of the Democratic Party in your campaign for sheriff? Gangsters. The Democrats aren’t just a different political party. The Democrats (and the Republicans) are in power right now and they have the ability to use different departments of government to harass anybody who wants to step forward and create something independent of the one party system. If that means using the Department of License and Inspection, using the Parking Authority, using the Housing Department, they don’t hesitate to do it. What is Kensington, the Philadelphia neighborhood where you live, like? Mother Jones once marched from Kensington to the United Nations to call attention to the children who were losing their limbs working in the factories. If Mother Jones were alive today, there would be no factories in Kensington for her to march from. It’s the poorest district in Pennsylvania and it’s multi-racial, reflecting the growing equality of poverty. We have the third highest hunger rate in the country—higher than Jackson, Mississippi or the Bronx. It has the highest homicide rate in the country. It’s a very difficult place to raise children–the city of Philadelphia has announced they will close forty schools while the state of Pennsylvania spends more on prisons than it does on education. There is a high rate of AIDS and there are drug war shoot-outs every day. In Kensington, it’s common to see people living out of shopping carts or for pregnant women to sleep outside. There’s barbed wire around the food bank. But I love Kensington because there’s a lot of pride in the amazing people who live there. You have to be a fighter and survivor to be able to stay alive in the neighborhood. 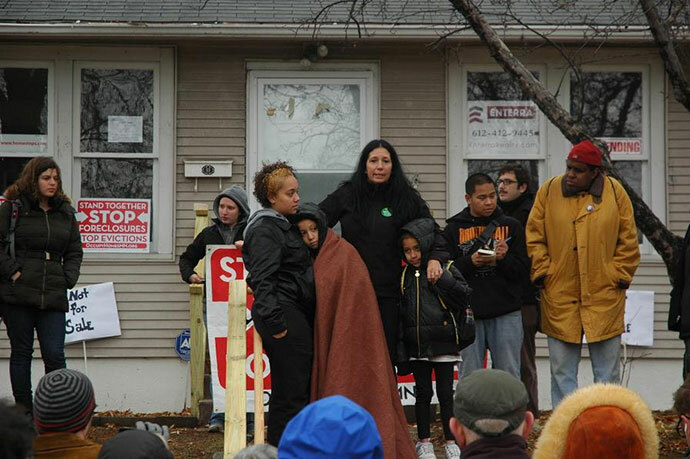 Many people refuse to leave and have been fighting against the gentrification that’s going on. Since 2009 there has been a 54% increase in the number of Green Party registered voters in Kensington. What does this say about traditional assumptions that the environmental movement is mostly a white, middle class movement? Kensington has been home to refineries and factories and a lot of polluted land. There’s a high rate of miscarriages and all of the hospitals have asthma units. It’s no accident that the question of the environment is an issue that people of color have always been involved in but they don’t get the kind of spotlight as some other environmental struggles. But the Greens embrace everyone—that’s what it will take to save the planet. What has been your experience with community gardens? I used to think that community gardens or farms were just for environmentalists who used the community garden process to creep into poor communities in order to gentrify them. But now I’m very active in our local campaigns to reclaim unused land. In Kensington, we’ve taken a big piece of vacant land –we call it a community farm—in which the only rule is that anybody who eats from the farm has to participate in giving back to the development of that farm. The fight of the next generation is going to be over who determines how land is used and who does that land belong to. Community gardens and farms should be turned over to the local people in the form of a community land trust where the people who live in the local area determine the rules for that land. If they don’t want a Wal-Mart coming into their neighborhood, they should be able to prevent that. If they determine that a piece of land should be used instead to grow vegetables and the food should be given away free because neighbors are hungry then they should be allowed to do that. When we marched from New Orleans all the way to Detroit for the US Social Forum in 2010 we were amazed that there was a community garden in every poor neighborhood that we passed through. More and more, that’s how people are feeding themselves. Many people think of the Green Party as being concerned only with the environment. Is that accurate? The Greens have a long history of promoting respect for the earth based on the understanding that we’re in very serious trouble if we don’t heal our environment. But the Green Party is not a single-issue party as can be seen from the fact that they selected me as their Vice Presidential candidate. The Greens are linking people together around issues such as peace, health care, the “school to prison” pipeline, police brutality, and community land trusts, just to name a few. The Green New Deal is modeled after Roosevelt’s New Deal during the Great Depression. We believe that this Green New Deal is absolutely possible and that it’s not a pie in the sky kind of plan. The Green New Deal has four pillars: An economic bill of rights, green transition, real financial reform, and a functioning democracy. For more specifics, check out jillstein.org. Millions of immigrants do not have the right to vote in the United States. You are running for an elective office. Do you reach out to them anyway? Absolutely. We’re outraged that President Obama is the Deportation President—he has deported more people than any other President in history. Immigrants are a big part of our national fabric now and we can’t move forward without a morality based on “everybody in, nobody out.” When I ran for sheriff in Philadelphia part of my platform was that I would refuse to cooperate with ICE in deporting our brothers and sisters. I have worked with many immigrant families who are sleeping in cars, sleeping under bridges, working in deplorable conditions only because they don’t have a right to things like housing and health care. This shouldn’t happen to anyone in a country of such abundance. We are translating as much of our literature as possible into Spanish, we are talking not just to domestic press but international press and to all of the various different newspapers and radio stations. Throughout the country, we are reaching out to immigrants to insure that they’re a part of this conversation and a part of this campaign. I should add that this campaign isn’t just about the upcoming election. The Green Party is going to put together task forces which will bring together people impacted by issues such as health care, foreclosures, peace, education, and, of course, immigration. We want to do this in a way that involves the people who are most affected, coming together in a room to come up with their vision of what they’d like to see in America and then draft a road map on how we’re going to get there. It’s often said that we live in a post-racial world. What do you think? Racism certainly still exists but there’s also a growing equality of poverty and misery. Because we live in a country of such abundance we can provide everybody a job, food, housing, and a productive place in society. Once we’re all living humanely, we can learn to love and appreciate each other. How would you assess the position of women in the United States? Things are getting much more difficult for women in this country. Women have had to take on additional burdens because we’ve had an economic draft into the military, we’ve seen our partners or our children fill the jail cells. So we’ve had to take on the extra burdens of trying to work and trying to raise families, very often by ourselves. The only way we can have true equality for women is by insuring that we have full employment, universal health care, and free education for every woman and every man. Jill Stein is a doctor. She’s studied and teaches internal medicine. She has talked about environmental health her entire life. She has done all of this and raised two young men who recently graduated from college. I’m a single mother, a formerly homeless mother of two children. Neither the Democrats or Republicans have ever had an all-female ticket which is just another reflection of the fact that they have never had things like health and housing and education at the core of their platforms. What did the Green Party have to go through to get on the ballot in your home state of Pennsylvania? We had a huge fight in Pennsylvania where the Democrats only have to get 2,000 voter petitions signed to get on the ballot, the Republicans only have to get 2,000 voter petitions signed and we had to get 40,000. We had to work from six in the morning til ten o’clock at night and then another group of people had to stay up all night long to verify the petitions. We did all that in a state that has a huge number of unregistered voters. What is significant about the Green Party’s experience in gaining ballot access and matching campaign funds in so many states? The Green Party will be on the ballot in at least forty states. We’ve qualified for federal matching funds in most of those. That has never been done before by an independent party. It’s not just a statement on behalf of the Greens, it’s a statement on behalf of the American people. They’re tired of going nowhere except down. We are far from having any kind of democracy in this country. The money we raise, even with matching funds, is just a drop in the bucket compared to the funding Obama and Romney are getting from a handful of billionaires donating to Super PACs. We were able to get on the ballot only as a result of major fights in each of those states. It hasn’t been a democratic process—there are different rules for independent parties, rules that are created by Democrats and Republicans, the one corporate party in this country. The Republican Party is famous for its Southern strategy. Does your campaign have a Southern strategy? We know that in order to uplift the nation, we have to uplift the South. So we place a lot of emphasis on participation and involvement and getting out the vote in the South. The Greens have a history of running folks for office who have come from the South: David Cobb from Texas, Cynthia McKinney from Georgia. We’re doing a lot of campaigning in the South and even though we’re not on the ballot in Georgia my running mate Jill Stein just came back from an extensive period getting the message out there. What is the significance of the Occupy movement? The Occupy movement has been a very important development in our country and around the world where people who are frustrated with and angry about not having a future began to call out the one per cent. Occupy isn’t just about reform. It’s a call for fundamental transformation. Jill and I see ourselves as the Occupy candidates. Everybody should go out and occupy the ballot. You know you won’t win. Why are you running? First of all, we don’t know that we won’t win. Jill and I are completely in this to win it. History doesn’t go in a straight line, it goes in leaps. It can happen here. But the win is also in the growing participation of people to take their country back by kicking the drug that has been sedating them—the two faced one party system of Democrats and Republicans. If we can create a huge exodus from these corporate-backed parties, that too will be a win. Will the Green Party getting on the ballot in Pennsylvania and many other states hurt Obama? What is going to hurt Obama is that after four years in office people can now see that he is pro-war, anti-immigrant, and nothing but another tool of the one per cent. If we continue to vote for the corporate-controlled, one party system in this country it will continue to hurt all of us. We’ve got to stop talking about “change” and be the change that we want to see. That means occupying the ballot in as many states as possible, not worrying if it’s a “swing state,” not worrying about whether or not we’re going to be “spoilers,” this whole thing is already rotten. We have to be pioneers and not be afraid of the unknown. My vision is watching the sleeping giant come to life. It’s just a question of education and organization and consciousness. Once it wakes up, it’s gonna take it from there. Most of the things we talk about in the Green New Deal we can make possible in our lifetime. It is not unrealistic. What is unrealistic is to expect the one party system to do anything to uplift the American people. I’m a formerly homeless mother. I have two children and I have slept in cars, under bridges, in abandoned houses and for the last twenty-five years I have taught people how to build homeless encampments and take over abandoned churches, abandoned houses, in an effort to stay alive and create leaders and help them develop the kind of consciousness they need to participate in helping to build this larger army in order to take this country back. That’s who I am, that’s what I’ve been doing for twenty-five years, and I only see my run for Vice President as an extension of that.